C Ahmadi-Yazdi, S Habashi. Schwannoma of Accessory Nerve: A Case Report. The Internet Journal of Otorhinolaryngology. 2005 Volume 4 Number 2. Schwannomas are benign neural tumours which arise from the nerve sheath and consist of Schwann cells in a collagenous matrix. Schwannomas of the accessory nerve are rare lesions. A case of Schwannoma originating from the spinal accessory nerve in the posterior triangle of the neck is described. Accessory nerve Schwannoma usually presents with nerve palsy. Unusually, our patient presented with a lump in the neck. Location of such neoplasms in this region is exceptional. This report describes the clinical features of a rare extracranial accessory nerve Schwannoma. The authors emphasize the importance of accurately enucleating the mass; when it is impossible to preserve the continuity of the neural pathway, nerve repair should be considered. A 40 year old lady was referred by her GP with a lump in the right side of her neck for a year. She had not noticed any change in the size of the lump during that time. She was also complaining of frequent sore throats, though these usually lasted only for about a day. There were no other associated ENT symptoms. She had a history of hypothyroidism for which she was on Thyroxin 125 mcgs once daily. Examination confirmed a 1.5/1.5 cm firm, mobile, non tender lump at the anterior border of the Sternocleidomastoid muscle. At operation, she was found to have a tumour arising from the Accessory Nerve which was shelled out maintaining continuity of the nerve. Histological analysis showed this to be schwannoma with no evidence of malignancy. She made an uneventful recovery apart from some stiffness of her shoulder and numbness of the cervical skin. The movement of her shoulder recovered completely following physiotherapy and numbness over the skin became unnoticeable by 5 months following surgery. Schwannomas characteristically arise focally from the sheath of a nerve fascicle forming a well-demarcated, eccentric mass that deflects the parent nerve. The neoplasms are encapsulated with a smooth, sometimes lobulated, external surface. Secondary degenerative changes commonly are present in large lesions and include yellow fatty areas and cysts of varying sizes. Red or maroon discoloration may be present, signifying recent or remote haemorrhage. The characteristic physical examination finding is denervation atrophy of the trapezius and Sternoclidomastoid muscles (9). Of the remaining lower cranial nerves, cranial nerve VIII is most often compromised, and cranial nerve XII is infrequently affected (10). Hypoglossal nerve dysfunction tends to occur with large intraforaminal masses. When a prominent intracranial component of tumour is present, signs and symptoms referable to brain stem and cerebellar dysfunction may be identified (10). The purpose of this manuscript is to take into consideration the slim possibility of cranial nerve tumor presenting as a lump in the neck. 1. Patel MR, Davies L. Schwannoma, Cranial Nerve. E Medicine online Journal. 2002 July 19. 2. Gilmer-Hill HS, Kline DG: Neurogenic tumors of the cervical vagus nerve: report of four cases and review of the literature. Neurosurgery 2000 Jun; 46(6): 1498-503. 3. Eldevik OP, Gabrielsen TO, Jacobsen EA. 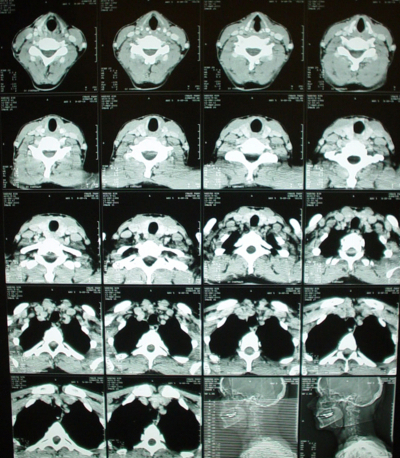 Imaging findings in Schwannomas of the jugular foramen. AJNR Am Journal of Neuroradiology 2000 Jun-Jul; 21(6): 1139-44. 4. Lo WW. Tumours of the temporal bone and the cerebellopontine angle. In: Som PM, Bergeron RT, eds. Head and Neck Imaging. St Louis: Mosby; 1991:1046-1108. 5. Lanzieri CF. MR imaging of the cranial nerves. AJR Am J Roentgenol 1990; 154: 1263-1267. 6. Bilaniuk LT. 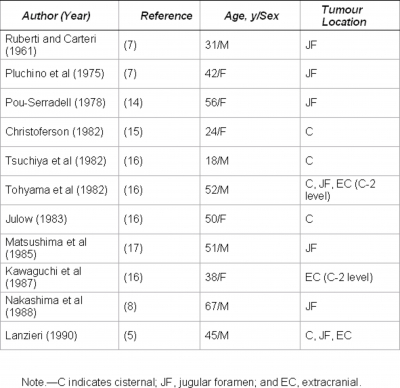 Adult infratentorial tumors. Semin Roentgenol 1990; 25(2):155-173. 7. Hakuba A, Hashi K, Fujitani K, Ikuno H, Nakamura T, Inoue Y. Jugular foramen neurinomas. Surg Neurol 1979; 11:83-94. 8. Nakashima T, Tomita K, Uemura T, Matsushima T, Fukui M. Accessory nerve Schwannoma extending extracranially to the second cervical level of vertebra. J Laryngol Otol 1988;102:959-961. 9. Noyek AM, Chapnik JS, Wortzman G, Kandel R. Schwannoma of the intrasternomastoid portion of the spinal accessory nerve: sophisticated pre-operative MRI diagnosis and appropriate surgical management. J Otolaryngol 1992; 21:286-289. 10. Gomez Beldarrain M, Fernandez Canton G, Garcia-Monco JC: Hypoglossal schwannoma: an uncommon cause of twelfth-nerve palsy. Neurologia 2000 Apr; 15(4): 182-3. 11. Schmalbrock P, Chakeres DW, Monroe JW, et al: Assessment of internal auditory canal tumors: a comparison of contrast- enhanced T1-weighted and steady-state T2-weighted gradient-echo MR imaging. AJNR Am J Neuroradiol 1999 Aug; 20(7): 1207-13. 12. Colreavy MP, Lacy PD, Hughes J, et al: Head and neck schwannomas--a 10 year review. J Laryngol Otol 2000 Feb; 114(2): 119-24. 13. Wilson-Pauwels L, Akesson EJ, Stewart PA: Cranial Nerves: Anatomy and Clinical Comments. Decker BC; 1998. 14. Pou-Serradell A, Llovet-Tapies J, Galito E, Pascual J. Neurinome . intracranien du nerf spinal. Rev Neurol (Paris) 1978;134:803-805. 15. Christoferson LA, Leech RW, Grossman M. Intracranial neurilemoma of the spinal accessory nerve. Surg Neurol 1982;18:18-20. 16. Kawaguchi S, Ohnishi H, Yuasa T, Hashimoto H. Spinal accessory nerve neurinoma in the C2 spinal canal. Neurologia Medico-Chirurgica 1987;27:1190-1194. 17. Matsushima T, Fukui M, Matsunaga M, Kitamura K, Hasuo K. Accessory nerve neurinoma mimicking a brain stem tumor on angiography: report of a case. Neurosurgery 1985;16: 839-842.